Aryabhata (476-550) was an Indian mathematician and astronomer. He is generally considered to have begun the line of great Indian astronomer-mathematicians that flourished during the country’s classical period. Several of his calculations showed remarkable accuracy for the era, with some remaining the best available for many centuries. He is sometimes referred to as Aryabhata I, since several later scientists of the same name also produced notable works. Aryabhata came from southern India, but his precise place of birth is not known. Some authorities suggest that Kerala is the most likely location, while others believe that Dhaka or Maharashtra are more probable. It is, however, generally accepted that he studied at an advanced level in Kusumapura in modern-day Patna, where he remained for some years. A contemporary poem places Aryabhata as the manager of a scientific institution; the precise nature of the body is not given, but there are grounds for suspecting that it may have been linked to the astronomical observatory that was maintained there by the University of Nalanda. 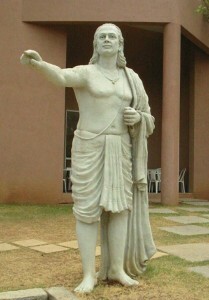 While studying at the university, Aryabhata produced the Aryabhatiya, his major work. Written at the age of just 23, it ranges widely across mathematics and astronomy, but is particularly notable for its calculations regarding planetary periods. The value given for the length of the Earth’s astronomical day differs from the true value by only a matter of minutes. Aryabhata also worked out a value for pi that equates to 3.1416, very close to the approximations still used today. Using this value, he was able to calculate that the Earth had a circumference of 24,835 miles. This is correct to within 0.2%, and remained the best figure available well into medieval times. While working on the calculation of pi, it is possible that Aryabhata may also have discovered that number’s irrationality. The relevant text is inconclusive on this point, but if he did establish the irrational nature of pi, he beat the first European mathematicians to do this by many hundreds of years. The Aryabhatiya also contains solid work regarding the solar system. It states correctly that the light cast by planets and the moon is caused by sunlight reflecting off their surfaces, and that all planets follow elliptical orbits. Aryabhata was also able to describe accurately the processes that lead to both solar and lunar eclipses. For several hundred years after its author’s death, the Aryabhatiya was unknown in the West, although its Arabic translation in the 9th century was of great use to the scientists of the Islamic Golden Age. The book was eventually translated into Latin shortly after 1200. The mathematical ideas contained within it were quickly adopted by Europeans, especially those dealing with areas and volumes, and with finding cube and square roots. However, Aryabhata’s astronomical findings had less impact, and it was left to later men such as Copernicus and Galileo to bring about the Western astronomical revolution. The first Indian artificial was named Aryabhata in his honor, as was a new university in the state of Bihar.